Visit Startec online at Startec.com which is a major long distance company offering savings to over 500,000 customers. For over 17 years, Startec has offered superior quality, outstanding service and great rates. With Startec's CellConnect program you can make international calls without changing your cell phone, plan, or provider. Call for less with Startec discounts, Startec coupons and Startec savings from 58Coupons.com. Check out Startec.com and you can save up to 80% on international calls from your cell phone. Startec.com will let you make International calls from as low as 1.9¢ per minute. Startec.com wants to give you $20 in credit when you refer a friend to their service. Plus the friend gets $10 in credit when they join. Seems like a good deal all around. 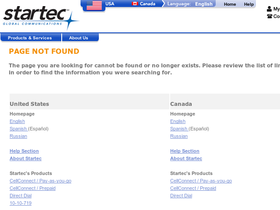 Enjoy using the service from Startec.com knowing they won't charge you any monthly fees. Startec.com's CellConnect Service is automatically included with your Direct Dial service. With Startec.com, you won't pay any connect or disconnect fees. Click link to get started. Sign up for Startec today and receive up to 120 minutes free plus a $10 gift card. Click link for details.